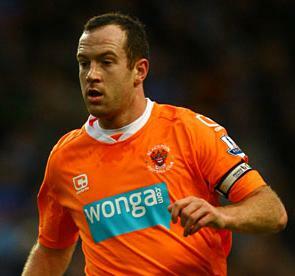 Charlie Adam will move on from Blackpool this summer and he will begin the new season at a new club. His time at Blackpool was a tremendous success for him and the club and he will be remembered as one of the finest players to grace the pitch at Bloomfield Road. This article will openly and honestly assess his ability and hopefully give fans of his prospective new club an idea of the player away from limited highlights that may have been packaged up by your regular media outlets. To start here’s a quick look at his key statistics from the season. 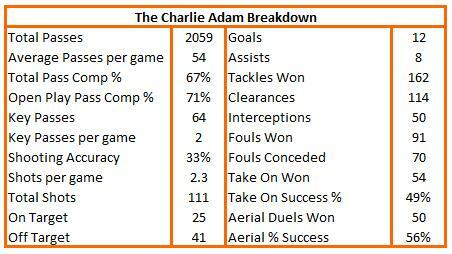 Those may be the stats that give a feel for what Charlie Adam is all about, however, that is within the context of Blackpool’s team structure and the season they had and it is important to keep them in that context. What cannot be detailed here is where this places Adam in the context of his Premier League peers as that data isn’t readily available for the purposes of this article. However, here are some observations that will add depth to the understanding of the player and what he will bring to his new club. 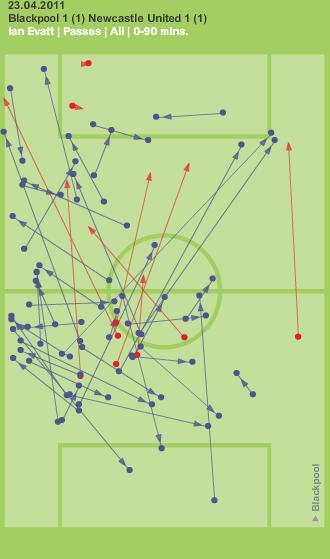 He is equally adept at finding both corners of the pitch with long penetrating passes either lofted or drilled low and flat, although the pass from left to right is his most natural play. He can execute them through a normal passing technique or via a higher risk volley pass which can be very potent when executed accurately. His first time passing (without looking up) can be sublime and well disguised, however, these carry a high tariff and don’t always work. If intercepted early enough then he can compromise his own team’s shape in the defensive phase. His passing over a short range is excellent and very reliable. 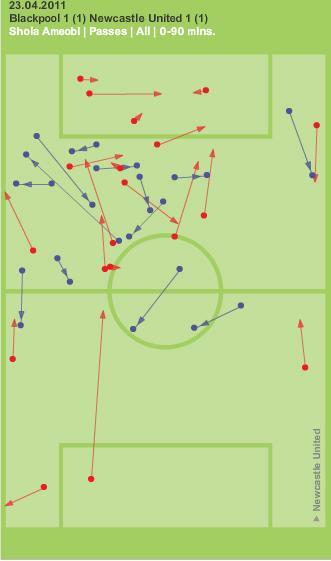 His passing is equally excellent regardless of pitch location, edge of the box passing can be as good as passing from the deep. Near the edge of the box he will attempt a diagonal ball cut between and behind defenders getting them to turn. He does however, need time on the ball in order to pick his pass and if a team puts him under pressure, he can be caught in possession by an astute opponent. If his awareness allows him to sense danger he will surge forward to create space to release the pass. However, his accuracy can suffer in these situations as his focus tends to be disturbed. 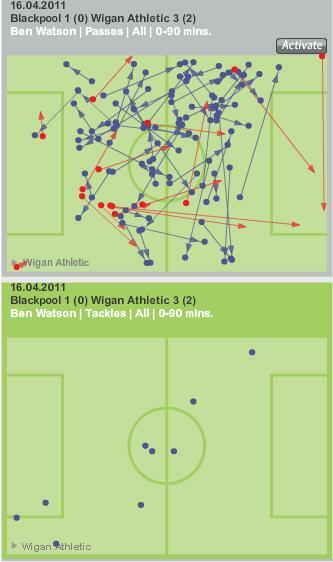 Below you can see how his pass completion fluctuated throughout the season from a high of 81% to a low of 45%. 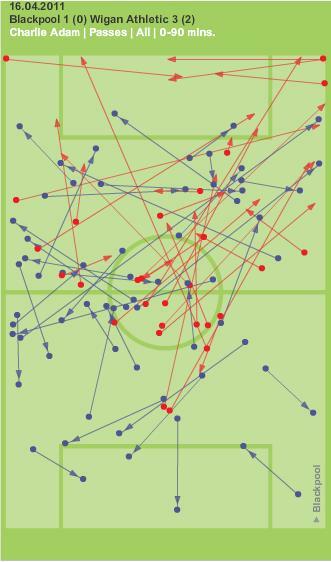 Note: Where the line is thicker it means the number of successful passes was higher. He has pace, a common misconception is that he isn’t quick. He’s certainly not a hundred metre runner, however, his pace over the first few metres is enough to take him away from most opponents especially given his upper body strength and ability to fend off tacklers (he has a take on success rate of 49%). However, this pace cannot be sustained over distance and will look to a drag of the ball or a nutmeg to beat his man rather than engage in a foot race. Physically he looks strongly built, if anything he may be carrying too much body fat which would improve given the right circumstances as Blackpool’s approach to fitness conditioning isn’t comparable to an established Premier League team. However, his stamina doesn’t appear to be an issue. 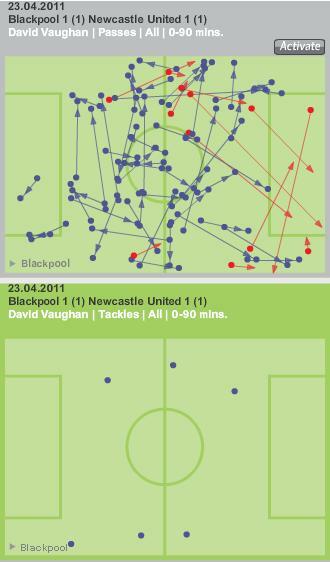 He is strong in head to heads, tough in the tackle, a decent leap is met with a good sense of timing and a strong neck gives him above average aerial power which he utilises more in his own box rather than the attacking one, more due to his positioning and role within the Blackpool team. He doesn’t appear to be overly susceptible to injury, tends to pick up very occasional knocks as opposed to serious injuries either by overuse or accident. He is excellent at delivering set pieces. Wide free kicks are better delivered from wide on the right hand side and generally hits them just above head height swinging inwards. His free kick delivery from wide left have a tendency to be hit low towards feet and behind the defensive line, swinging away from goal. He generally takes the majority of his corners from the right side, in-swinging, although has a tendency to over hit the ball. His striking of the corner can be inconsistent with a scuffed low and running corner being the key fault. His goal against West Ham was scored in this fashion, but it wasn’t deliberate as his celebration would confirm. His direct free kicks are especially dangerous, he is able to force a powerful strike hard and low or hard and at wall height or float and curl in to the corners. He is at his most dangerous when the kick is right of centre with the strike curling to the top right corner. 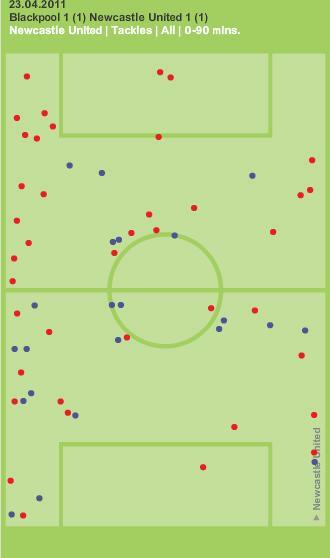 His penalties used to show a tendency to be struck low to the right corner, however, recently his penalties have shown his variation, with occasional strikes to the left making him hard to read. His placement shows reliability and will often strike them with power to evade the ‘keepers dive. He is a team player and selfless with it, he has filled in when the team are short of cover and has played centre forward, centre back and left back in games albeit for short periods. He leads his team by example, interacts with the crowd as well as appearing to be very vocal towards his team mates. He appears equally spirited between his own team and the opposition and plays hard, but fair. He appears to take time to recover from mistakes and possibly has highly critical self talk that might impinge on him delivering over a course of a match when a mistake has occurred. 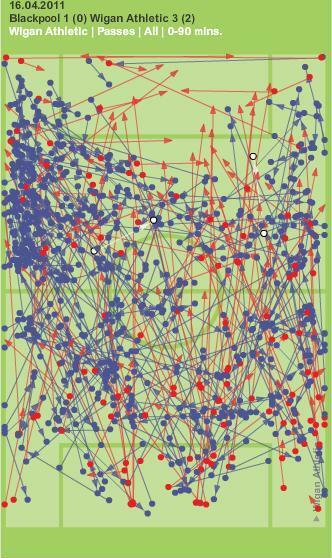 For example, an early misplaced pass or the own goal at home to Blackburn or being caught in possession prior to Birmingham’s second goal at St Andrews. His disciplinary record is marked by his persistent collecting of yellow cards (11 this season), however, it is rare that he loses his temper, even though he was sent off on his Blackpool for a stamp on an opponent. He does appear to have moments of passion where his focus is lost and can lead him in to the occasional rash challenge. He has good close control, the ball rarely escapes him. He is strong at taking the ball down with the chest and will shield the ball well. He is however, very left footed, passing and shooting accuracy suffer when he uses his right foot. An opponent who can make him turn on to his right side will enjoy an advantage. Within Blackpool’s 4-2-3-1 formation, he forms a part of the deeper two midfielders, but is more progressive than his partner and acts as a link from holding midfielder to the man at the tip of the midfield triangle. 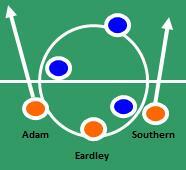 When Blackpool play their flatter 4-3-3 he will normally gravitate towards the centre left of the midfield three. He can set up plays from the middle and left of the pitch (1 & 2), but is given license to support the attack in the final third (4) and can easily play in that more advanced role. He tracks back well to close out space in the defence and will support his left back when under attack, covering runs in behind. He can hold the deeper position (3), although it tends to be against his natural attacking instinct. He made some of his early appearances for Rangers wide left (5), although his lack of pace means he wouldn’t necessarily penetrate the opposition back line, but his delivery from out wide could be utilised more often as well as his link up passing to bring others in to the game. As revealed in the programme notes for the game at home against Manchester United it is interesting to note that he believes his best position to be at centre half (6) and this hints at the possibility of him covering as a sweeper in some schemes. He is adept at dropping deep between the centre backs when then spread to cover full back raiding forward. From this position he will comfortably hit long diagonal passes (left to right is the most common) or revert to short passes. Should he be employed in a 4-4-2 then he can be exposed against the opposition central midfield pair, should they work hard to pressurise him and to cut off the link from his midfield partner. 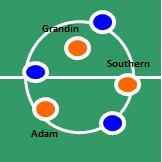 It would be unwise to utilise him in this formation given his propensity for needing more time on the ball. A midfield three gives him support and passing options as well as cover for when he breaks forward. He has an excellent understanding of the pitch in front of him and where the space is in front of him in which to pass the ball. 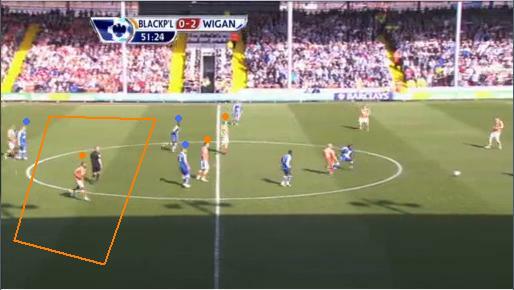 He can often see the plays that his Blackpool team mates cannot which can lead to misplaced passes. Should he be surrounded with players of a greater understanding, anticipation and pace his passes may link up more often. However, his vision tends to be limited and doesn’t possess a good awareness of a full 360 degrees which often means he is unaware of what is going on behind him, which not only reduces his passing options, but leaves him susceptible to a timely intervention by an opponent from behind. 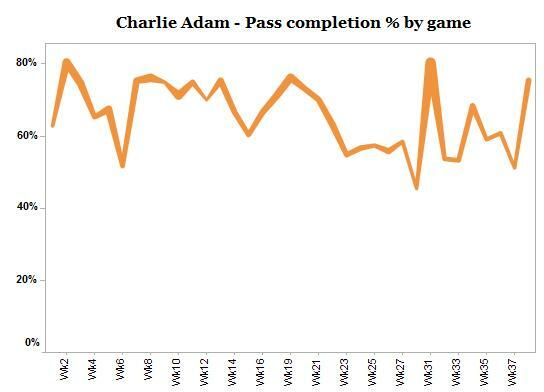 Adam is a good central midfielder, with excellent passing range, good technical ability but at times tries to repeat the extravagant pass a little too often. He has great value to his set piece delivery and is tough and good spirited. Physically strong, but requires a better base fitness which might improve his speed and stamina. His vision needs improvement as do his reactions to working in tighter spaces. What is possible is that his drive, desire, ambition and determination to learn and develop suggests that he will improve given the right conditions. Good and great football teams have a core set of players who hold the team structure together, it is often referred to as the spine of the team. 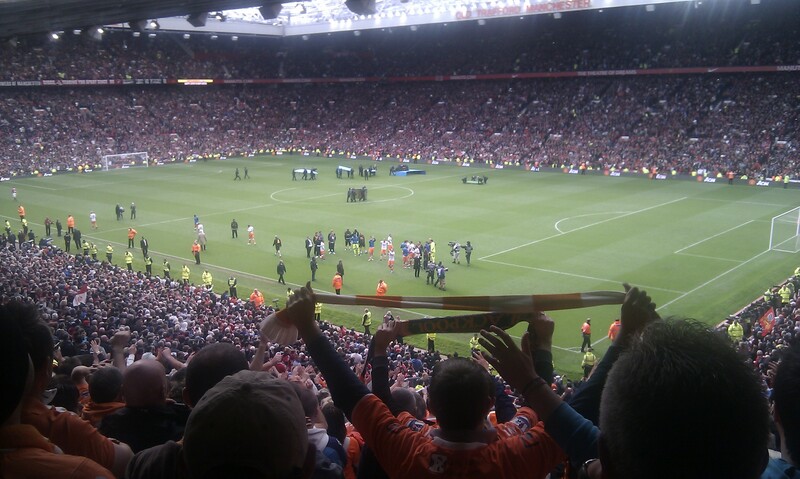 Throughout their promotion season from the Championship Blackpool had a spine of players who pulled together to make Blackpool a fantastic attacking team and gave them great consistency in the run in which saw them come from nowhere to secure promotion. When the Premier League season kicked off that spine still remained, however, the supporting figures were either not up to standard, inconsistent, ageing or too new to Ian Holloway’s methods to provide strength in depth. 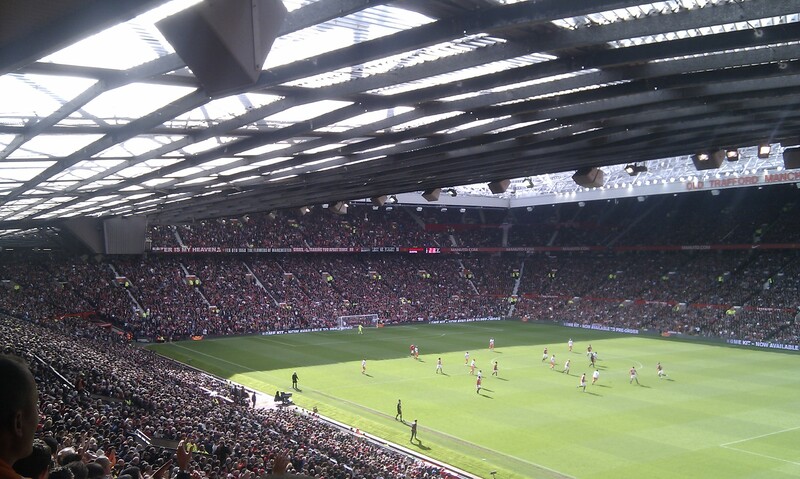 As the season progressed players integrated in to the side and some of the newer players became ‘first choice’ options. However, none of these players served to be a genuine replacement when any of the spine missed games. Did that really matter? 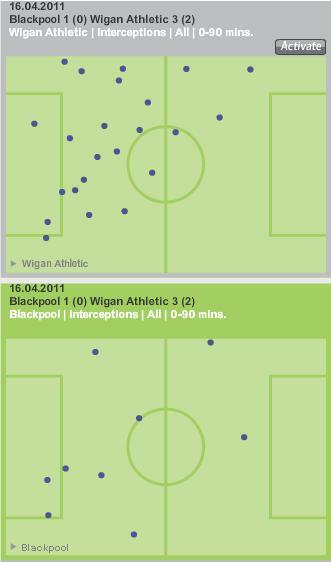 Did losing key players have any impact on Blackpool’s results? Ian Evatt, Stephen Crainey, David Vaughan, Charlie Adam and DJ Campbell could be defined as being the spine of the Blackpool side. 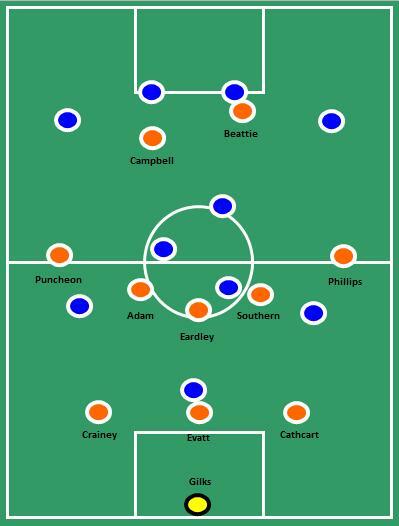 When these five players lined up for Blackpool the whole team appeared to play with much more verve, vigor and assurance. However, what was the record for the games when these players lined up against those matches when they didn’t? With all the spine present Blackpool gained 27 of their 39 points in 21 games at a rate of 1.29 points per game which should they have stayed together in the side and completed all 38 games, Blackpool would have racked up 49 points. They won 33% of the games they lined up in. 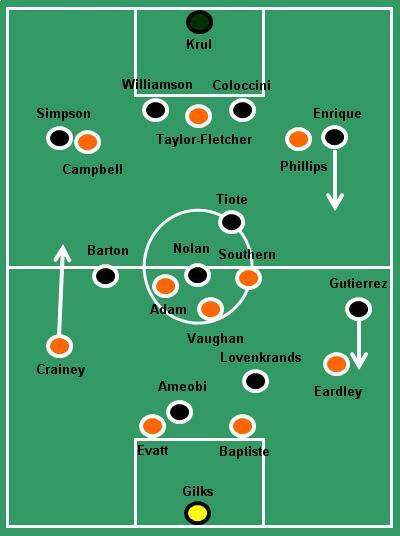 In the other 17 games when that spine was removed either in whole or in part, Blackpool racked up 12 points at a rate of 0.71 points per game which is half a point down on the games when the spine of the team was in place. Blackpool won only 18% of these games. This is a crucial set of facts when you consider Blackpool’s fate. They clearly didn’t have either the quality of back up players or the ability or time to integrate them in to the side with restricted playing opportunities or a planned approach to squad rotation. Injuries played a large part in disrupting the spine of the team as well as suspensions. David Vaughan picked up hip injury that kept him out of three games back to back and Stephen Crainey suffered with an ankle ligament injury that kept him out for six games. Then DJ Campbell got sent off against Wolves and missed three matches whilst Charlie Adam’s persistent bookings meant he missed three matches through suspension. What is really important to note is that of that spine it is very likely that on the opening day of the new season Blackpool will only have Ian Evatt left. 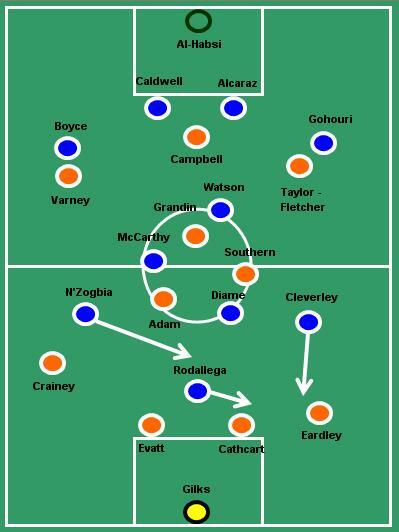 What can Blackpool and other teams learn from this experience? Should Blackpool ever get back to the Premier League then it will be because they again have a solid spine, but they will need to ensure that their spine isn’t compromised and spend time considering how that spine will be best replaced in the case of injury and suspension. Blackpool will hope to recruit potential peripheral players to serve as shadows or to recruit first team players in other positions with the calibre to flex their field position and game approach. With the break up of the spine as Blackpool move in to the Championship then the true perspective of the task ahead of Holloway is huge, his inherited squad was never completed and developed to his satisfaction. It’s no exaggeration to say that he has to build from the ground up again. To think that this might take two years is a realistic prospect given the club’s approach to recruitment. However, should it take two years then surely prior to any eventual promotion, Ian Holloway will have plans in place to thoroughly develop his squad further to cope with the rigors of a full season in the Premier League.